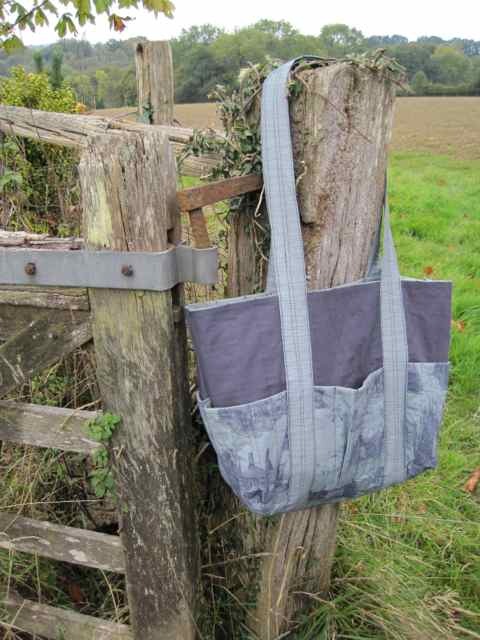 I recently attended a workshop with Amanda Hall of Monkey Buttons and I chose to make a ‘kangaroo’ bag. It was a great opportunity to trial run some of my toile fabric. I do like the teal green of this toile. Thank you Amanda for a super day, although we had a power cut from 12.30 to 3pm, we still managed to achieve a lot of sewing once we could use the machines again. Because I am passionate about hops but also a quilter, I naturally began looking for hop themed fabrics as soon as I started quilting in 1999. I especially was looking out for a toile. When I did not find any that I liked, I started to play around doodling sketches of my own ideas. The design process was so enjoyable that I ended up with a range of 7 fabrics – the problem was how to get these drawings from the paper and printed onto fabric? I was very lucky with generous advise from Janet Clare as to how to submit your designs to a fabric company. Janet has her fabric available through Moda. I was naturally attracted to my favourite brands of fabrics and hoped to have one take up my designs but although I submitted them it was not to be. Basically I was told that whilst they liked the story the fan base for the subject would be too small for their huge print runs of 3000yds per design. However, now the designs were drawn up I knew it was something I truly believed in and there was no going back, I definitely did not want to throw the towel in at that point. So far that was the easy fun bit – the designs had to be put into a suitable format for uploading for printing. My biggest thank you has to go to Sylvie Heasman of Art on Fabric for making my fabric possible to use in the first place. Research on the internet for companies who print fabrics to order revealed a whole new world I knew almost nothing of. Then I happened on the profile of one of the resident designers for one company and read that she would also design on commission. Sylvie Heasman of ‘Art on Fabric’ . It was the was the ray of hope I was looking for but it meant taking what was a huge leap of faith, I had to put my complete trust into someone who was then a total stranger. However it was either do that or forever wonder ‘maybe, what if…..’ and that was not an option. The risk had to be taken and Sylvie’s profile felt right, so I took a deep breath and emailed her. Sylvie kindly agreed to put my hops designs into the right digital format for uploading to the printers computer system. She performed the ‘ta da abracadabra’ and viewing on line still has that ‘as if by magic’ feeling, I could not have done this and am eternally grateful to Sylvie for her patience and skill. It is still a thrill to make something with the fabric I designed which has only been made possible by Sylvie’s skill. I can honestly recommend to anyone who has a design idea in their head, to contact Sylvie who will make it happen for you. The fabric printers Woven Monkey have been excellent too, even with my limited IT skills their site is easy to use. The variety of fabric types to choose from and their colours are also a joy. See my full range of hops inspired fabrics available in various colourways at Woven Monkey.